Beginners in chess have many Chess Questions. Various answers to different questions are listed on this page. Read them and get an idea about different aspects of the game. In chess if the king is in check, and the piece that is giving check is placed directly adjacent from the king, can the king capture it? Yes, as long as the king does not go into check of another piece by capturing the check-giving piece. "Zwischenzug" is a german word. "Zwischen" means "between" and "Zug" means "move". An "in-between move". For example your opponent captures your bishop with his knight, but before you recapture his knight, you first give a check with a piece to chase his king into the corner. After that you recapture the knight. In other words you do something in-between the normal course of operation. You do an in-between operation. A Zwischenzug can be very dangerous and can win a game outright as you might win a piece in-between by capturing a piece and giving check at the same time. The king must move and you gained one move this way. After that you return to the original operation and recapture the piece that your opponent has taken. White moves 1. Nd5!! attacking the black Queen with his Queen. Black must capture the white Queen 1...QxQ because the black Queen is not protected. 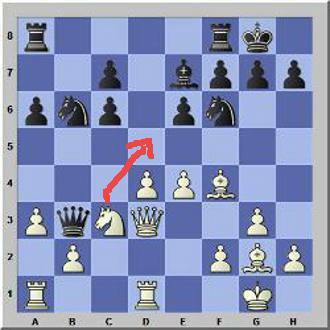 The King must move away 2...Kh8. Now White recaptures the Queen 3. RxQ and remains a piece up. White has a big material advantage and should win the game sooner or later. Can a king move to a square that is attacked by a pinned piece? Of course not! No! A king can never move to any attacked square. Can a king castle after having been in check? This depends! He can castle only if he has not moved before out of the check, then back to its original square. For example, if he has covered the check of a bishop by putting a knight in between. In this case the king has not moved itself and can castle in the future. In short: A king that has moved before can never castle. Can a king castle passing through an attacked square? No! Keep in mind that a king can not castle through an attacked square or into check. But a rook can pass through an attacked square in the process of castling. Can a king castle after being in check right now? No, a king cannot castle to escape an active check. OR you capture the check-giving piece. Get this: If the king moves away he can never castle again in the future in this game. Is a pawn allowed to make a non-capturing move when he could capture? Yes, you can do what you like, moving the pawn ahead or capturing. This is up to you and you decide what is best in the particular position. You can even promote the pawn to whatever piece you like, moving it to the eighth rank, if it is sitting on the seventh rank and must not capture anything. When it is my turn and I touch a piece or pawn, must I move it? Yes, If you touch a piece or pawn you must move it, if this is legally possible. If you do not intend to make a move, but just want to adjust the position of the pieces and place them correctly on the board then you must announce this before with the french words "j'adoube". This means: "I touch". Having said this, you can move a piece around as you wish without being required to move it. When I play chess using a chess clock, which hand do I have to use to hit the clock button? Use always the same hand that moves the chess pieces on the chessboard. If you move the chess pieces with the left hand because you are left-handed, then you have to hit the clock button with your left hand as well. You are not allowed to use both hands moving pieces and hitting the clock. Who decides at which side the clock has to be placed? The player, playing the black pieces, decides at which side the clock has to be placed before the game starts. As most chess players are right-handed, they will place the chess clock at their right hand side. This is more comfortable for them to press the clock button fast, when they are short of time. If my opponent offers a draw do I have to answer? Your opponent is allowed to offer a draw only if it is his turn. He usually makes his move and offers draw at the same time. This way he gives you the chance to evaluate his move and to convince you that his move is strong enough to warrant a draw. You can think about his move for sometime and if you intend to accept his draw offer you can tell him so and shake hands. If you don't want to consider draw at all, you just make your move without saying anything and the game continues. If I repeat the position three times. Is it a draw? This is the threefold repetition rule. You can claim a draw if the same position will occur three times after your next move or has occured three times with the same player to move. The reasoning behind this rule is that if a position is repeated three times, no progress is being made. If a position occurs for the third time and it is your turn or if it is your turn and you intend to repeat it the third time, you must claim the draw with the arbiter before you make your move.